Iraqi voters are preparing to cast their ballots in general elections on 30 April. No single bloc is expected to win a majority of the 328 seats in the Council of Representatives. This Council, in turn, will elect the Iraqi president and prime minister. However, current Prime Minister Nouri Maliki's Shia-dominated State of Law alliance is widely seen as the front-runner. The election comes at a time when violence in Iraq at its highest level since the peak of the sectarian insurgency from 2006 to 2008. Here voters across the country discuss their concerns and hopes for the future of Iraq. I will be voting in the elections even though I have been displaced from my city Fallujah in Anbar province due to the continuous violence that is happening there. I believe that the elections are the only peaceful way to result in change. We have been protesting against the government but this hasn't brought any change, and it won't as long as the power is in the hand of a small group, whose only concern is to stay in power as long as they can. I believe in the elections. I think it will bring change as there is a wide agreement between many of the Iraqi parties not to renew Mr Maliki's mandate for a third term. They know if this happened, we will face a dictatorship that we will never be able to get rid of. Several things concern me. The most important is the integrity of the elections, as the election process in Iraq is dominated by routine fraud. Much of the results are known in advance, and using the new electronic voting process actually makes it easier to cheat the system. I am also worried by the security situation in the Sunni-dominated province of Anbar, especially in the districts of Ramadi, Khaldiya, Falluja and al-Karma. There is a possibility that voting would not be held there, thus barring people from participating in the elections. This means there will be no real representation of all the Iraqi people in parliament. I will be voting in the election; it is a vital one as there are many Gulf countries that are trying to control and divide Iraq. I will vote for Nouri Maliki, the current prime minister, as he is the most capable of saving Iraq and the Shia sect. The Maliki government's performance in the last couple of years hasn't been the best. There had been corruption but this was because of the politicians from the other parties who joined Mr Maliki's government. What is most important is that Mr Maliki doesn't call for division in the country as some Sunni parties do. Other Sunni parties are sectarian and helping the terrorists. Meanwhile, other Shia parties like that of the former Prime Minister Iyad Allawi are forming an alliance with other Sunni parties and this will lead to a non-Shia prime minster or one that can't do much without referring back to the Sunni countries like Saudi Arabia and Qatar. This is not fair for the Shia sect, who as the largest sect should have the right to have their own prime minister. I live in Kadhimiya, a northern neighbourhood of Baghdad with a Shia majority. But I run a shop in al-Mansour neighbourhood, which has a Sunni majority. I will be voting in this election. Since the fall of Saddam Hussein's regime in 2003, I have always believed in the democratic system as a way to change. It has been proven everywhere that is the best way. Image caption "The most important issue that the new parliament should deal with is the economy as everything is tied to the economy"
I haven't yet made up my mind about who I will be voting for. But I will be choosing a candidate from the secular lists. I'm still comparing their manifestos though. I believe these candidates are technocrats who are more concerned with getting on with the job rather than appealing to and serving particular voters. I believe the right person should be in the right place no matter what his religious background. There is no way for fraud to occur in the elections because there are many independent organisations who are observing the elections and looking out for any discrepancies. Each candidate, also has a representative observing the elections as well. 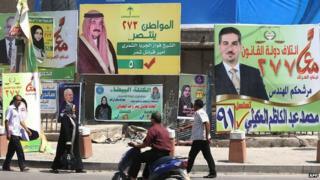 What is concerning is that in the mixed areas in Baghdad, the Shias vote for a Shia candidate and Sunnis vote for Sunni. This is disappointing as most voters will not be examining the background of the candidates and what they would offer Iraqis. There are some people from the different sects who deepen the tensions in order to get to parliament. They don't care about religion or Iraq. The sectarian divisions help them to secure a seat in the parliament. As a business owner, I think that the most important issue that the new parliament should deal with is the economy as everything is tied to the economy. If the economy is good, the security situation will improve. If people have access to affordable food and are able to find jobs, there wouldn't be any rising tensions that people then take out on each other on a sectarian basis. The first time I voted was in 2010, in Iraq's parliamentary elections. Can an 18-year-old fully comprehend the importance of their vote? Can an 18-year-old fully comprehend who is the right person to vote for? No, especially not in Iraq, because we're not politically educated. Public education limited our capabilities instead of expanding it. Therefore, those 18-years-olds are voting for those that their families are voting for. Each family is set-up politically in a way that matches the parents' beliefs. Each believes that this party or candidate will bring about the best outcomes - not necessarily for the whole nation but what's better for that family. Now, I am lucky that I've majored in political studies. But, think about those who are not educated in the same way that I've been. Their mindsets are still not based on what's the best for everyone, but still "what's best for me and my family". I have faith in the political process in the Kurdistan region of Iraq because the political culture of the Kurds is based on non-tolerance for oppression, freedom and the will to progress.